A large part of the centre of Datchet was designated as a Conservation Area by the Royal Borough's Planning Department in 1995. This means it is worthy of preservation or enhancement because of its special architectural or historic interest. The quality and special interest of the area as a whole is intended, rather than just that of specific buildings, although some of these may also be protected by Listed Building status. All the comments on these pages are quotations from the 1995 Conservation Statement for Datchet. Numbered points refer to sections of the complete document. The photos illustrate as many of its points as possible. 3.1 Chief Architectural Features: Datchet’s Conservation Area contains a mix of styles and ages of buildings ranging from 15th century timber-framed buildings, 18th century redbrick buildings, and 19th century decorated brick buildings, to 20th century in-fill. The diversity is increased by the range of sizes from small terraced Victorian dwellings to much larger detached and wide-fronted plots. 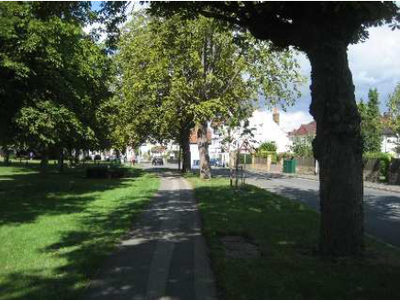 5.1 The Green: Datchet’s focus is its Green, an important and very busy open space. The activeness of the space creates a sense of being the village centre, and the main commercial uses front on to it. Although surrounded by roads, signage and street furniture, the Green retains a rural feel with its granite edging plus post and chain fencing. Queen Victoria’s Jubilee Oak is a visual centre and gives height to the space. Memorials provide points of interest in the spacious grassed area. 4.5; 4.6 Interesting groupings of buildings, especially around the Green, give Datchet a unique character: along South Green (scroll down further for archive photo from Church steeple) and at the corner of London and Horton Roads. Roof shapes vary from simple gables to more elaborate roofs with projecting attic gables. Mostly steeply-pitched red tile roofs, with 1870s tile patterning at Manor Houses. Use of decorative timber facing, particularly on gables, including the Pharmacy, Old Council Offices (decorative timber added to both in the 20th century) and the modern corner block at top of High Street. 3.6 Features of the High Street: Majority of buildings are two-storey in red brick with clay tiled roofs. Numbers 6 & 8 have a mansard roof with distinctive central chimney. 3.8 The Avenue, Montagu Road, Buccleuch Road: Residential roads with a good variety of two and three-storey Victorian brick houses. Often a mix of red and yellow brick to create patterning, or with decorative timber in gables. Above: The Pharmacy on the Green is a fine example of a mock Tudor or Jacobean timbered shopfront which was added to an older house about 1905. Below: The Bridge Café’s shop windows, with slim wooden glazing bars; before 1890 but may be much earlier. Photo 1891 flood. Butcher’s) before 1896 and to number 6 a little later, as Kinross’s Riding Court Farm Dairy. stretch of public space next to the boatyard an important one, with trees forming a background to the view. Art Deco garage, just beyond the boundary of the Conservation Area. 6.2 The River Thames still supports some activity, although mainly for pleasure, and has a small boatyard on Windsor Road, next to the public space. 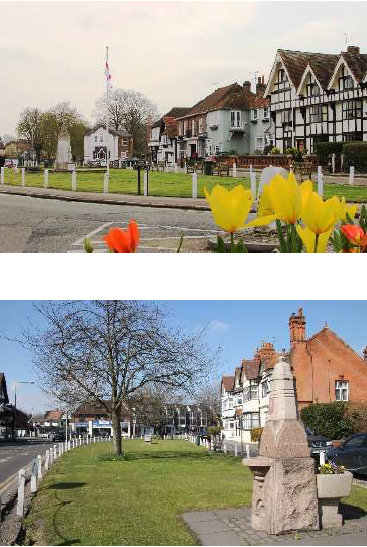 A document showing pictures of Datchet's Listed Buildings is available here. 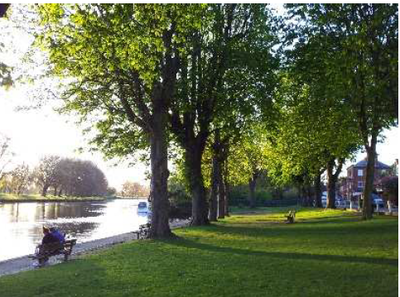 You can find general information about Conservation Areas, and what it means to live in one, on the Historic England website.